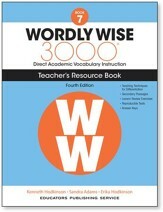 Wordly Wise 3000, 4th Edition, Book 7 contains 20 lessons with 15 words per lesson and focuses on preparing students to be able to decipher words they'll encounter in content area texts, literature, and tests. Lessons begin with word lists that include definitions with contextual sentences, much like dictionary entries; a selection of activities follow the word list, which may include matching words and definitions, matching synonyms and antonyms, identifying whether words were used correctly in a particular context, sentence completions, reading passages followed by comprehension questions, discussion/writing extension ideas, and other exercises . This book also comes with 12 months of access to Quizlet (with Grade 7 words pre-loaded), in which students practice learning words and definitions in an ad-free environment, test themselves on their knowledge, and play motivating games to reinforce long-term retention of words. 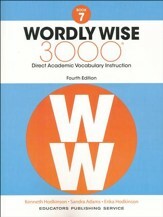 Wordly Wise 3000, 4th Edition for 7th grade focuses on preparing students to be able to decipher words they'll encounter in content area texts, literature, and tests. This Grade 7 Teacher Resource Book includes vocabulary activities, reproducible tests, answer keys, teaching techniques for differentiation, and secondary passages. 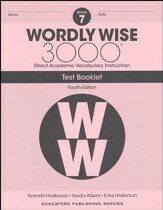 This Wordly Wise 3000 Book 7 Test Booklet, 4th Ed. is designed to be used with the Wordly Wise, Book 7, 4th Ed. workbook (sold-separately). 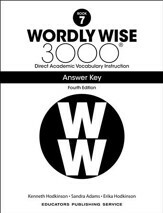 This answer key is designed to be used with the Wordly Wise 3000, Book 7, 4th Edition student book (not-included and sold-separately). Answers for each lesson are included.